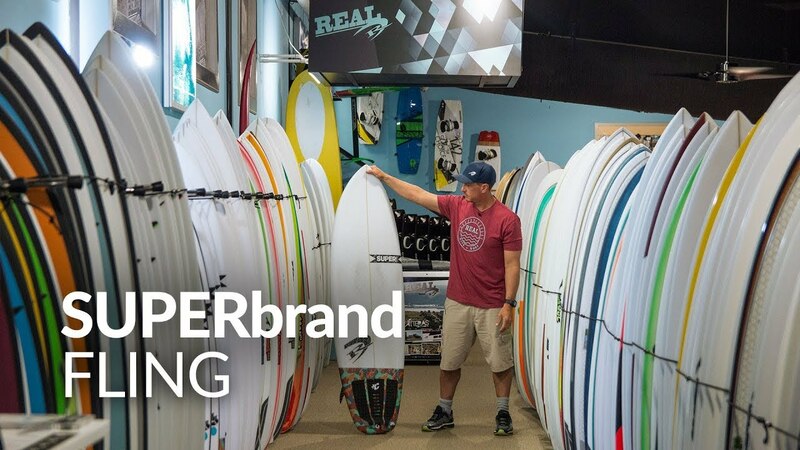 Surfing Surfboards SUPERbrand Surfboards SUPERbrand Fling SUPERbrand Fling PU/Poly 5'8"
The Fling is Brett Barley's go-to board for smaller to average waves. Shred hard and get your party on in weak/mushy conditions with the Fling! "This is one of our most versatile designs, pretty much anyone can take this surfboard out and have fun!" The Fling delivers both the easy paddling small wave efficiency of a "fishy" board and the snappy, sporty feel of a more performance oriented shortboard. With the perfect combo of glide and maneuverability, the Fling will keep the fun going through mushy summer waves and still hang tough when the waves have a little punch. Compared to other grovel-focused boards in the same category, the Fling sports a narrower overall width that boards with similar volumes. By using an outline that is still pointed at the nose but then widens up quickly and carries the width through to the tail, the Fling can pack tons of volume into the board without the need for one exceptionally wide point in the board. The (relatively) narrower outline is indicative of higher performance and allows the rider to set a rail or transition from rail-to-rail with ease, even with a deep single concave in center of the board. Thanks to all the "high performance" elements in the Fling's design, it fits in tighter spaces that most grovelers and is no stranger to finding the pocket. This can be especially useful at dumpy beach breaks or anywhere the waves can be round even when they are small. Using Cape Hatteras as an example, when the conditions line up you could see rounder, barreling waves that are only in the 2-3 foot range. When a "mini-barrel" session like this lines up, you can usually find Brett Barley riding his Fling, packing tubes and punting airs while surfer's on less efficient boards are hopping and bogging. The Fling has a fairly big wave range, and depending on the skill of the surfer and the shape of the waves, it can be ridden comfortably into head high waves and even bigger if the waves are slopey or open-faced. In addition to being a small-wave magic board, the Fling is a ton of fun on bigger waves that are mushy or don't have a ton of push. When the session is full of large, peeling mushburgers, you'll feel fast and free zipping around on the Fling and drawing any line you want. Although the Fling comes standard with 5 fin boxes so you have endless options for fin configurations, during our testing we felt like a 3-fin thruster was by far the best fin setup for this board. When running the board as a thruster, the turns are more pivotal and snappy but you aren't losing any speed compared to running it as a quad. Although we encourage everyone to try the board as a thruster and a quad to see what works best for your personal style, we think 90% of surfers will like this board best as a thruster. You want a board that grovels well but still allows you to surf with a shortboard style. Regardless of your skill level, the Fling will aid your progression and keep the fun going in a wide range of "everyday" conditions.